Paperback Book & CD-Rom (1999). ISBN: 0767402456. 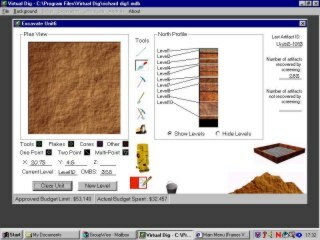 Purchase details from: http://virtualdig.com/ Minimal requirements: Microsoft Windows 95/98, PC with a Pentium processor, 16 Mb RAM, 800 x 600 SuperVGA resolution (32k colors). 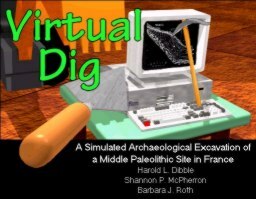 This book/CD-Rom publication seems intended to enhance the 'method and theory' segment in many undergraduate archaeology degrees, to escape from traditional drawings of sections and information on various digging styles. As such it is a bold move, especially when budgetary considerations also feature writ large in the planning - as indeed they must on all real excavations. The CD-ROM is held in an envelope at the back of a large support book, 148 pages with an index. The book acts as a help file for the programme and is illustrated with black-and-white images. 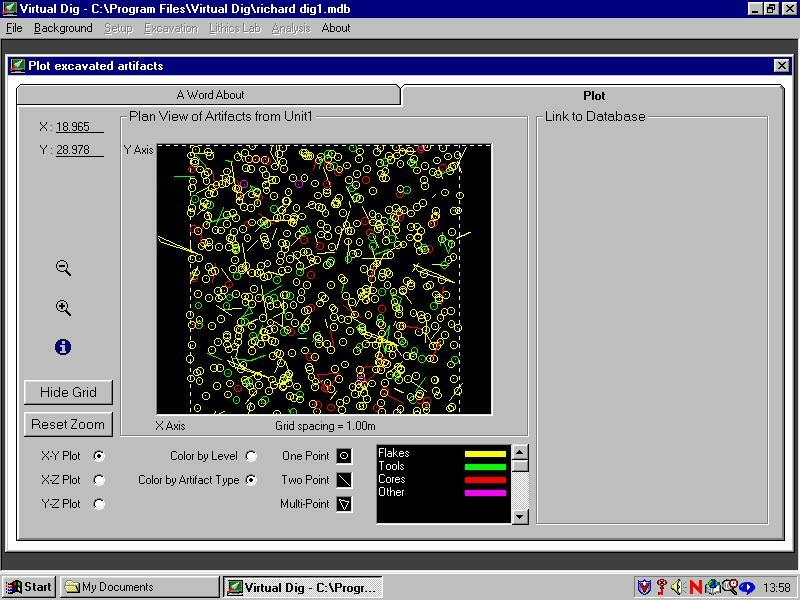 Having loaded the CD-ROM and started the programme, the next step is to enter a username in order to establish a database of results. 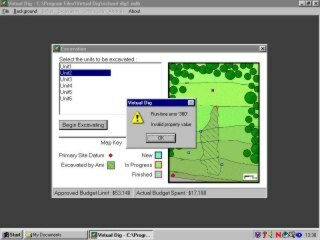 Virtual dig is an access-based programme and uses this to retain your position in the exercise. 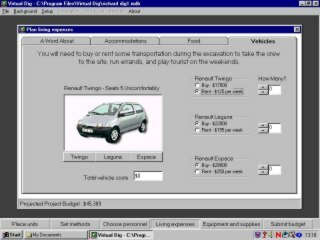 This programme does not override the toolbar at the bottom of windows, thus enabling people to toggle between programmes should they wish (something of a design fault in the Journeys in the Roman Empire CD-ROM, I felt). Our excavation is centred on research at Combe-Capelle in France. This is a Palaeolithic site and, as such, employs some specific techniques perhaps not utilised too frequently on excavations of later period sites. As with all excavation projects, the starting point is some desktop research. With this CD, this is confined to some background information on the site and on Neanderthals in general. I would have appreciated some more detailed survey information, perhaps with aerial photographs. From here one is invited to put together a research design before permission to excavate is granted. The user decides upon the number of units to excavate (of set dimensions) and is asked to place them on a plan of the site. 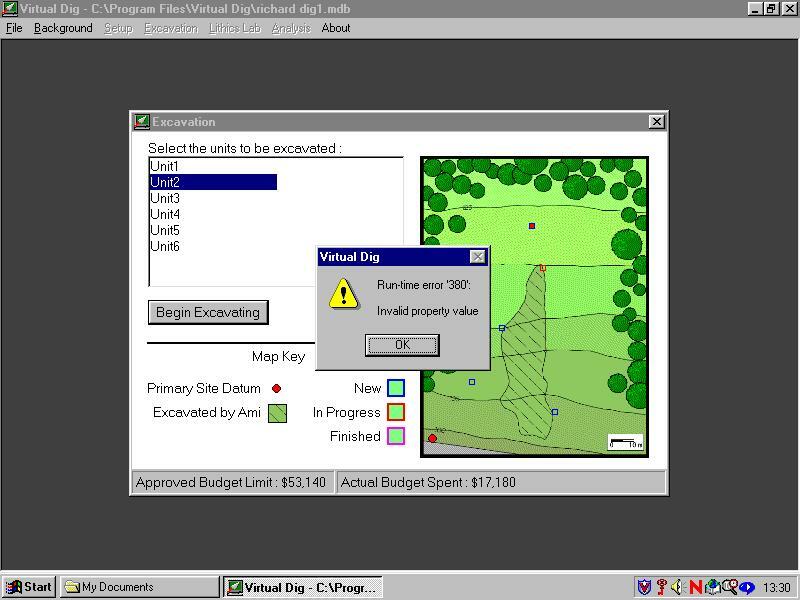 Although by no means a criticism, judging by the language used, Virtual Dig is geared more to an American user-base. Following the choice of excavation units, decisions on team numbers, of time these people should spend on site and what they are to be paid, on excavation techniques, and on tools and equipment, all need to be made. It was here that I learnt that a 'backhoe' was a JCB. I was also a little surprised by the choice of site vehicles. Rather like the thoughts of rival Henry Ford's product (to paraphrase, you can have any colour car as long as it's black), here you can have any make of car as long as it's Renault. It seems a strange choice - I've certainly never been on an excavation where the entire fleet was composed of this make (and am struggling to think of even one such car I've seen on a dig). 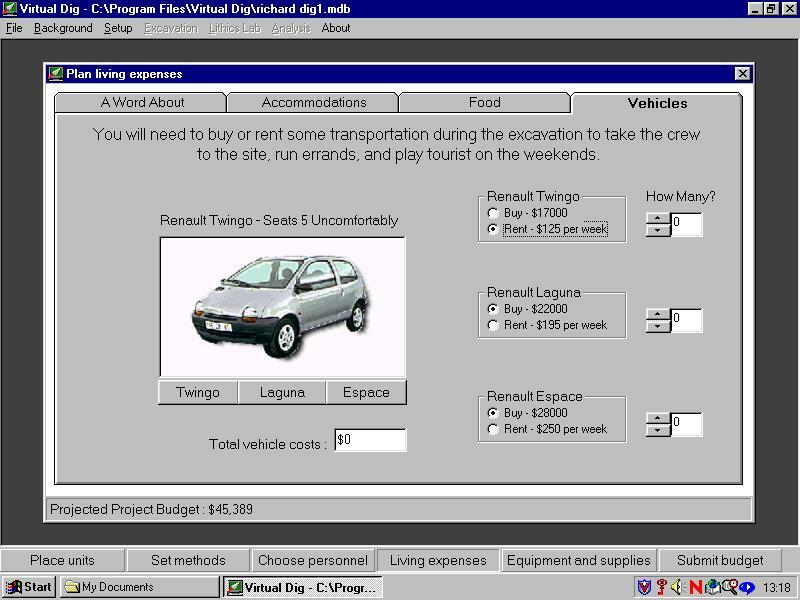 I was left wondering whether such a vehicle brand name was worth putting into the project. When your budget is complete it's time to submit it to a panel of three, unnamed, experts for review. 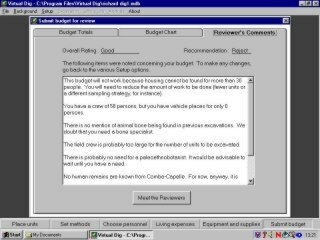 It is certainly possible for this budget to be rejected, and pointers are then given as to how you could improve it and why. One such tip is not to take an archaeobotanist as no such remains had been found previously. 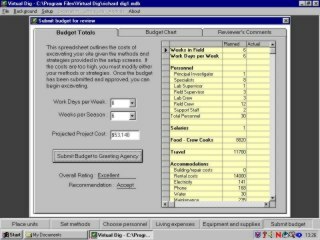 This is perhaps one of the best parts of the programme - the need to set proper budgets is vital to archaeological work, though contingency funds are always needed. Having said this, excavation elements on this CD all seem to run very smoothly to plan with no need for emergency funds or decisions - a most pleasing change! With an accepted budget, one can then move to excavation of the test pits that you selected in the initial phase of analysis. 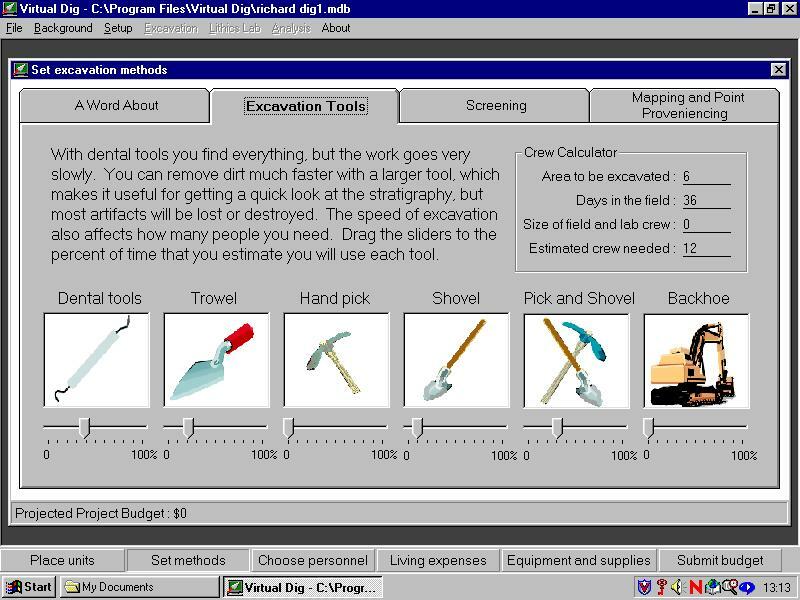 You are given the choice of excavating 'automatically' (whereby the computer will remove the layers and record finds) or undertaking the excavation yourself. 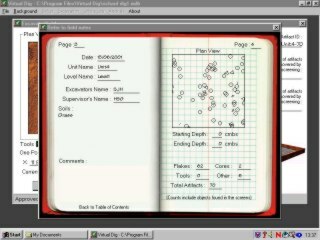 This latter option caused my computer to eject me from the programme on several occasions which made excavation a lengthy progress. The excavation 'techniques' involve removing squares of a size of your choice and then demarcating layers within the section yourself. All finds are 3D spot-recorded using an EDM (quite a neat piece of programming), and the spoil is then sifted for any finds that your excavation techniques have failed to locate: I recovered 32 finds from one layer thanks to my shoddy digging. 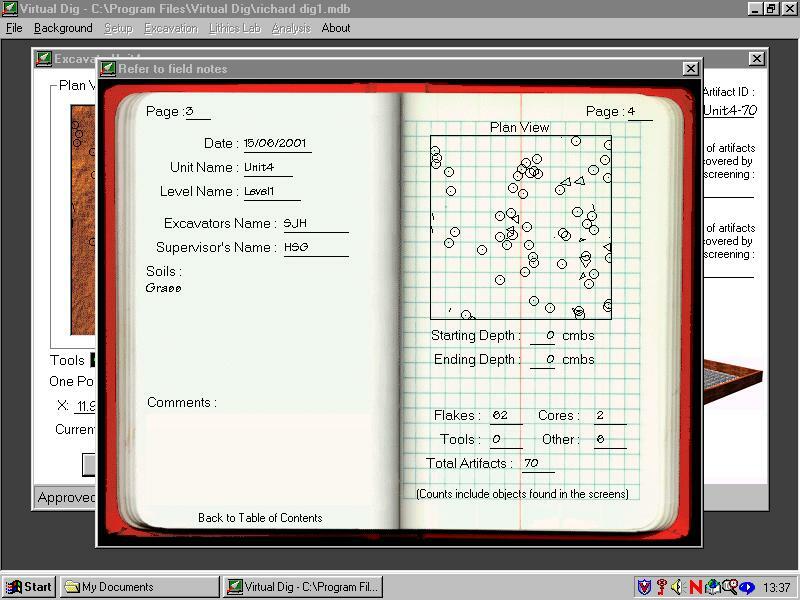 By recording finds and denoting different layers you are also adding entries into the notebook segment, and this will be vital when you come to write up the excavation - should you choose to do this. These entries include sections and comments about the various contexts, with other statements about the weather also included. Following excavation of your chosen segments (and you are helpfully told when you have reached natural) you can then analyse your finds to plot their distributions and create relevant charts. 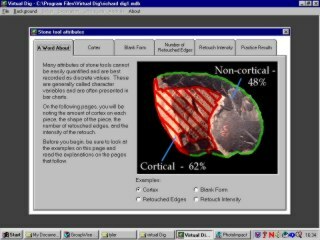 This then leads to an overall examination of flint-working techniques and studies, these segments having several simple, well-designed areas from which the user can highlight their particular choice. As with the CD on Journeys in the Roman Empire, one feels that following the analysis of finds there is an absence of an 'end game' - you have notes, sections etc. and have gone through all the elements of organising the dig and budgeting but no final report is produced. I can appreciate that the multitude of outcome possibilities might render such an automatically generated report difficult, but it would be nice not simply to have to work through all the digital notebooks to produce an output. The producers of the CD state that the production of a report is a vital part of any excavation, but for this aspect the user is left very much on their own. 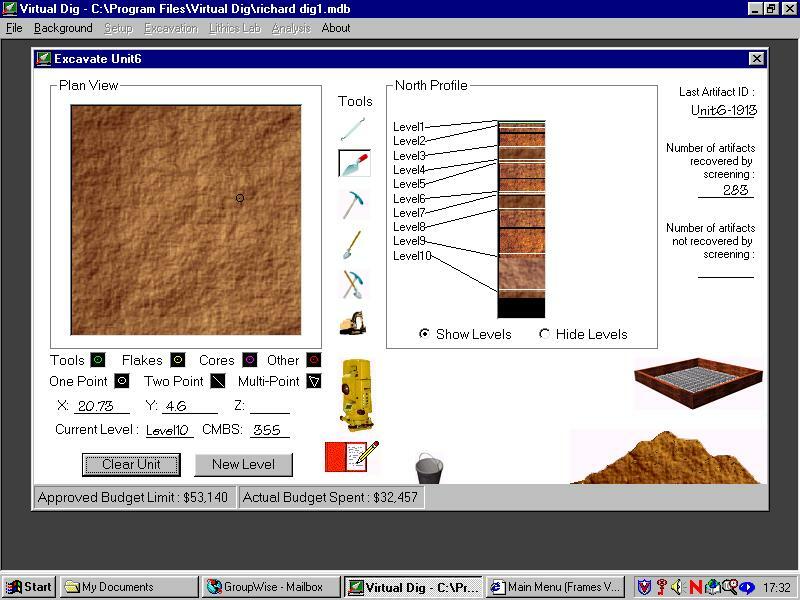 Although perhaps an interesting and enjoyable exercise, on its own a CD-ROM cannot be used to teach students to dig. This is something that this product itself acknowledges; an excavation can never really be experienced virtually. 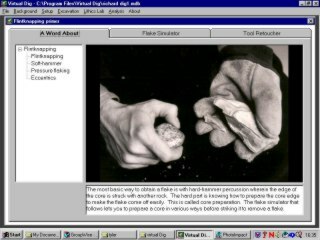 There are simply too many senses that are not employed when 'digging' by computer; the differentiation of textures and sounds whilst digging for a start. Other problems might include those of health of staff, weather, safety, theft, tourists, incompetence, and the ready availability of materials for the excavation. 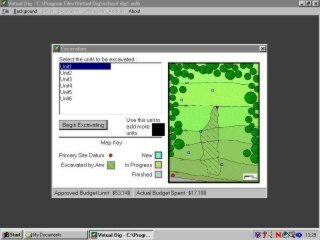 Virtual dig is also let down by some poor images, particularly when compared with the images used in Journeys in the Roman Empire and the standard of photography that is now expected on research excavations. 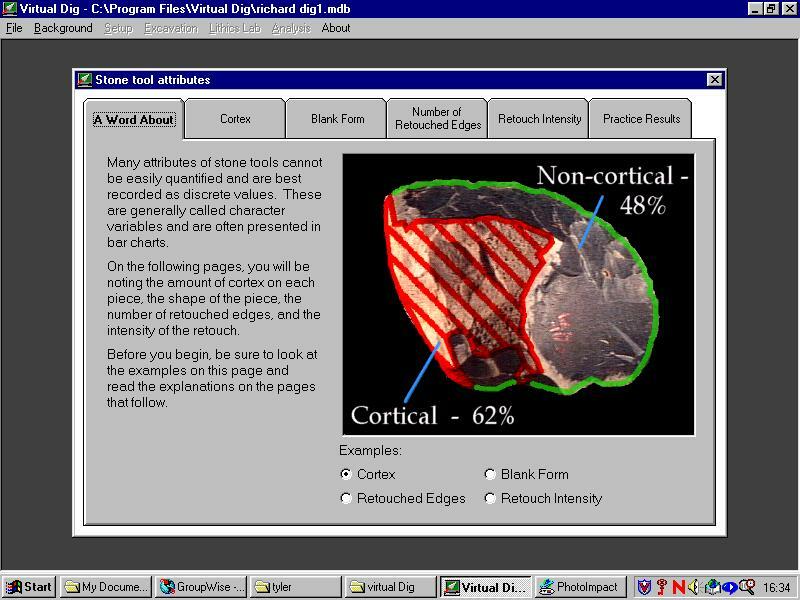 To criticise too strongly may, perhaps, be churlish; the CD is certainly imaginative and is welcome for the fact that it will introduce students to several techniques used on site, and also to some of the possible problems they might encounter on real excavations. The CD could prove to be a useful teaching aid to undergraduates with no field experience though some of its style and language would better suit it to an American user-base. 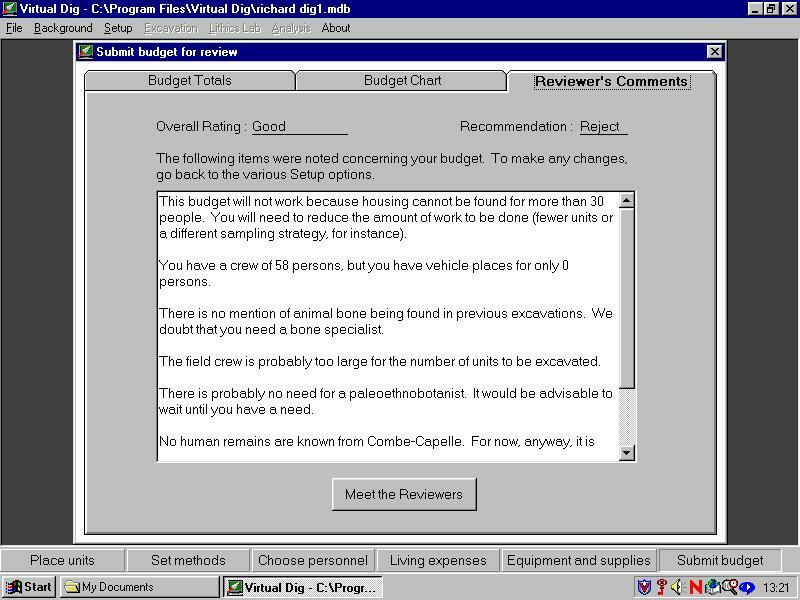 I can recommend this CD-ROM as something that is, for the most part, enjoyable, but it serves to reinforce the premise that there really is no substitute for real field experience.